Make no mistake about it, a new Xbox console is being revealed today (May 21). 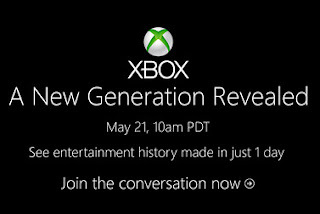 Microsoft has been hying up their event where they promise "A New Generation Revealed." With the announcement of the PS4 back in February and the release of the Wii U back in November 2012, Microsoft is feeling the heat and are ready to unleash their upcoming console. The event will begin at 1 p.m. ET. There are a number of ways you can watch the live feed. You can tune in to Spike TV. If you're on your Xbox 360 console and don't feel like moving, you can watch it on Xbox Live. Should those two options be out of reach, you can visit the official Xbox website and watch it there. Stick with FightVG.com as we will keep you posted when the console is revealed and if any fighting games are showcased or teased.